Roof Repair, comes as one of the hazards of being a Homeowner. 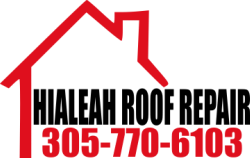 At Hialeah Roof Repair we try to make this part of Home Ownership as painless as possible. Our very first step is a thorough roof inspection to know for sure whether this is a roof repair or roof replacement situation. In either case we are here for you and offer the most knowledgeable staff in the area. We'll work with you and communicate with you in every step of the process. From Inspection to the completion of the project, we are there to make sure your Roof will withstand the Heavy winds, Blowing rains and little rodents that can come between the interior design of your home and an intact roof. Let us take the worry out of Roof Repair with a longstanding reputation of 5 Star Service as a reputable Roofing Contractor in your South Florida Community. If you have concerns regarding your Homeowners Insurance give us a call and we can work directly with your insurance company to be sure you are getting everything your policy allows. Hialeah Roof Repair works hand in hand with industry leaders on the latest updates to Insurance Industry changes and what requirements go along with them. We're in the know on compliance and code also.